Andrea Decruz, 41, is a Media Personality and owner of CINQ salon and Belmont Flora. 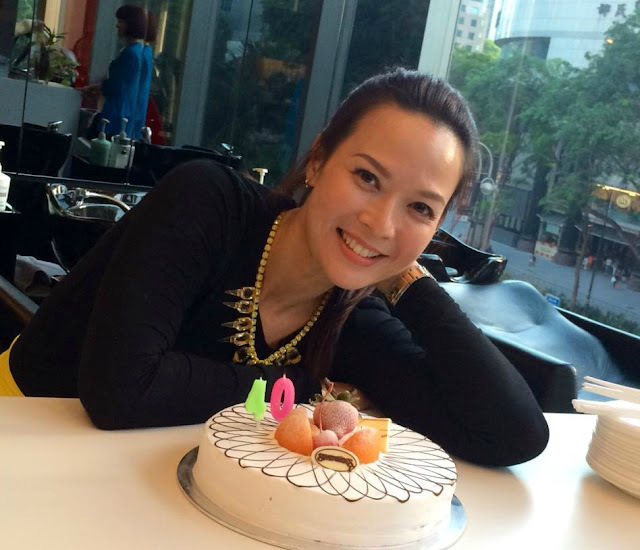 She is married to Pierre Png, a leading Mediacorp Artiste. I run the behind the scenes work at both CINQ and Belmont, dealing with human resource as well as public relations matters. I returned to Singapore in 1998 after a year of working in the San Francisco County Jail to join a private practice as a psychologist in Mount Elizabeth Hospital. I was soon scouted by MediaCorp (TCS back then) to join them as a full time artiste. I left the industry after my health failed in 2002 and took a long sabbatical before joining forces with my two current partners at CINQ in 2006 till today. As a child, I had always loved to pretend-play by washing and styling my mum and sister's hair! When I was asked to get involved in the beauty business, I jumped at the opportunity. When I see our clients' attitudes and emotions change as they walk out of the salon feeling like a million bucks especially when they walked in like they had the worst day ever. How do you rejuvenate yourself with your busy schedule? Sleep to me is very important. I need at least 7-8 hours of sleep to feel well equipped to begin my day. Once a week, I make it to Java Gaya for a detox lymphatic massage, and I make sure to get in a good 30 minutes of high cardio tebata workout three times a week. Success to me means having built a dream, weathering the storms and knowing that you are still above water. I sat on the board of Make A Wish Foundation for the past five years and continue to do my best to support the foundation as a volunteer. Always support your kids' dreams no matter how out-of-this-world they may sound. You never know - they might just turn out to be the next Mark Zuckerberg! You will have plenty of time to figure out all the other issues later on in life. In your teens, all you need to concentrate on is school, because without a good education, you are nothing. Kate's bedtime routine... or mine?